So it’s official. All hopes of ever purchasing a new 675 LT straight from McLaren have officially been written off. 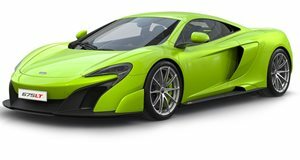 All 500 units of the new "Long Tail" McLaren have now completely sold out before even being built. The 675 LT was originally unveiled earlier this year at the Geneva Motor Show. This very special supercar is slightly longer than McLaren's 650S and is described as being the UK supercar builder's "most track-focused, yet road legal" model. The longer body enables it to achieve 50 percent more down force than the 650S. In addition, the $349,500 675LT is lighter than its shorter 650S sibling by as much as 220 pounds, and is capable of producing an astounding 666 horsepower and 516 lb-ft of torque from its twin-turbo 3.8-liter V8 engine. This, combined with a seven-speed SSG transmission, make it capable of hitting 60 mph in 2.8 seconds and achieving a top speed of 205 mph. Start looking on eBay if you plan on buying one of these bad boys because second-hand is now the only way to own one.